South African homeowners are considering gas in their homes as a result of Increasing costs in electricity. People are unaware that there are specific regulations that must be complied with to ensure that insurance policies remain valid. A certificate states that the installation has been properly inspected and is determined to be safe and leak free. An authorised person who is registered with the Liquefied Petroleum Gas Safety Association of Southern Africa (LPGAS) must issue the certificate. Any person who has a liquid gas installation in their home must have this certificate as per regulations. This is usually obtained during the installation phase. Homeowners need to know that the onus is on them to ensure that they have this certificate in their possession, not the installer. If your home is damaged or destroyed, as a result of a defective appliance – and you do not have a valid certificate issued by someone registered with LPGAS – the insurance implications could be significant. An insurance company would be well within their rights to repudiate a claim, which could have severe financial repercussions for the home-owner. 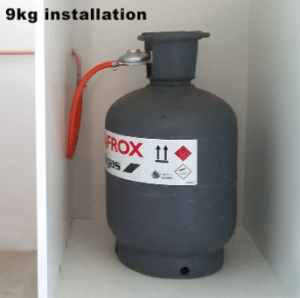 • Light bulbs cannot be less than 1.5 metres above a gas bottle. If you suspect your gas appliance is unsafe it is best to turn the appliance off immediately. Do not touch it until it has been checked by a registered gas engineer. Open all the doors and windows to air out the room. Ensure that you have shut off the supply at the meter control valve. Deed Of Sales Services (DOSS) are specialists in Electrical, Water, Electric Fencing, Beetle and Gas inspections. We provide you with a full report and a quotation to rectify any defects / faults and we have fully qualified and licensed technicians to attend to inspections and remedial work.